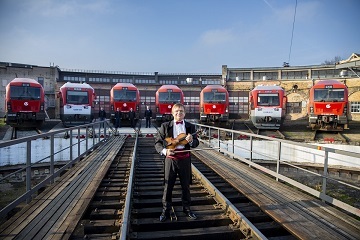 Seven locomotives performed Poland's national anthem in Vilnius on Friday as Poland's independence centenary approaches, informed Lietuvos Gelezinkeliai. "The anthem performed by the locomotives symbolizes the attitude of Lietuvos Gelezinkeliai (Lithuanian Railways) as we believe in non-standard solutions, break past stereotypes and we are a modern partner for our clients," Mantas Bartuska, CEO at Lietuvos Gelezinkeliai, says. The locomotive septet was directed by Zbignevas Levickis, the first violinist from the Lithuanian State Symphony Orchestra. "I am a Lithuanian Pole, and this occasion is also dear to me. I was very much impressed with work in a technical, not artistic, environment," the violinist said. Lietuvos Gelezinkeliai also performed Lithuania's anthem this way earlier this year when Lithuanian marked its own independence centenary. Poland marks its Independence Day on Nov. 11.